In July 1848 the Hungarians, led by Lajos Kossuth, fought for liberation from Austria. However, upon the Austrians’ request in 1849, Tsar Nicholas I sent Russian troops to crush the rebellion. Nevertheless, Kossuth’s initiative paved the way for the compromise in March 1867 (known in German as the Ausgleich), which granted both the Austrian and Hungarian kingdoms separate parliaments with which to govern their respective internal affairs. It also established a dual monarchy, whereby a single emperor (Francis Joseph I) conducted the financial, foreign, and military affairs of the two kingdoms. Nicholas I defined himself and his system as a militaristic one, and the first few years of his rule also witnessed his consolidation of power through force. 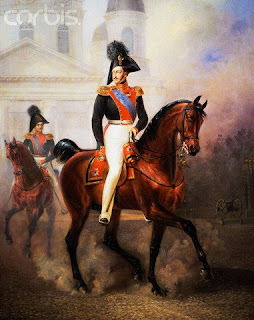 He continued the wars in the Caucasus begun by Alexander I, and consolidated Russian power in Transcaucasia by defeating the Persians in 1828. Russia also fought the Ottoman Empire in 1828–1829 over the rights of Christian subjects in Turkey and disagreements over territories between the two empires. Although the fighting produced mixed results, Russia considered itself a victor and gained concessions. One year later, in 1830, a revolt broke out in Poland, an autonomous part of the Russian Empire. The revolt spread from Warsaw to the western provinces of Russia, and Nicholas sent in troops to crush it in 1831. With the rebellion over, Nicholas announced the Organic Statute of 1832, which increased Russian control over Polish affairs. The Polish revolt brought back memories of 1825 for Nicholas, who responded by pushing further Russification programs throughout his empire. Order reigned, but nationalist reactions in Poland, Ukraine, and elsewhere would ensure problems for future Russian rulers. Nicholas also presided over increasingly oppressive measures directed at any forms of perceived opposition to his rule. Russian culture began to flourish in the decade between 1838 and 1848, as writers from Mikhail Lermontov to Nikolai Gogol and critics such as Vissarion Belinsky and Alexander Herzen burst onto the Russian cultural scene. Eventually, as their writings increasingly criticized the Nicholaevan system, the tsar cracked down, and his Third Section arrested numerous intellectuals. Nicholas’s reputation as the quintessential autocrat developed from these policies, which reached an apex in 1848. When revolutions broke out across Europe, Nicholas was convinced that they were a threat to the existence of his system. He sent Russian troops to crush rebellions in Moldavia and Wallachia in 1848 and to support Austrian rights in Lombardy and Hungary in 1849. At home, Nicholas oversaw further censorship and repressions of universities. By 1850, he had earned his reputation as the Gendarme of Europe. At the end of 1848, after the successful suppression of a revolt in Vienna in October, a new Austrian government led by Schwarzenberg took office and the Emperor Ferdinand abdicated in favour of his young nephew, Francis Joseph. The Austrians were now able to turn their attention to the restoration of Habsburg rule in Hungary. In Prussia Frederick William IV, encouraged by the Austrian example, dissolved the Prussian constituent assembly and promulgated a new constitution. As 1848 drew to a close, it seemed as if order was being restored. However, in January 1849, the effects in Europe of Kossuth's decision to make use of the Poles in the Hungarian forces brought an unpleasant surprise in the shape of the victories of the Hungarian army in Transylvania led by General Bern. At the request of the local Austrian military commander and in the face of opposition from Schwarzenberg, Nicholas reluctantly agreed to a limited intervention by some of the Russian troops based in the Danubian Principalities in support of the Austrians. The intervention was not successful and by the end of March the Russian troops were forced to withdraw along with the defeated Austrian forces. Nicholas was dismayed and determined that any further military intervention he might be called upon to make would be on a suitably massive scale. Bern's success in Transylvania was followed by further Hungarian victories elsewhere on Hungary under the leadership of General Görgey and by the middle of April the situation had become critical. The replacement of Windischgraetz by Weiden as Austrian Commander-in-Chief in Hungary brought no improvement. Despite Radetzky's victory against Piedmont at Novara on 23rd March, continuing Austrian difficulties in Italy made it impossible to transfer troops from there for use against Hungary. As a result, a reluctant Schwarzenberg and Austrian Council of Ministers were compelled to yield to military necessity and appeal to Nicholas for Russian assistance in suppressing the revolt in Hungary. Austria's first request was for aid in restoring the situation in Transylvania which was rejected by Nicholas as being impractical. This was followed by an urgent personal appeal to Paskevich in Warsaw for the dispatch of Russian troops to assist the Austrians in dealing with the threat of a Hungarian attack on Vienna and renewed outbreak of revolution in the city. Much to Nicholas' displeasure Paskevich sent a composite Russian division by rail from Cracow to Moravia without seeking the Tsar's approval. Nicholas had made it clear from the outset of the revolutions in Europe which began in 1848 that he would not intervene unless Russia's interests were directly threatened. He could hardly refuse a request from the Austrians for aid especially as he had given a solemn promise to the Emperor Francis before his death that he would come to the assistance of his "idiot son" or successor if misfortune should occur. Nicholas was not the man to break his promise and in any case, he was being asked to defend the cause of order in the struggle against revolution which had begun in France in 1789. Nevertheless, just as be had been reluctant to intervene in the Danubian Principalities the previous year, he wished to be certain that Russia's own interests were directly threatened. The increasing involvement of the Poles in Hungarian affairs provided Nicholas with the answer to any doubts which he may have had. Bern's successes in Transylvania were followed by reports of a threatened invasion of Galicia, possibly led by General Dembinski, another of the Poles who had joined the Hungarian cause. A Polish general was active in the Sardinian army and Nicholas had not forgotten the part played by the Poles in causing disturbances in the Danubian Principalities. It seemed to him that Hungary was about to become the centre of a general conspiracy led by Russia's eternal enemies, the Poles, against all that was sacred. The Hungarian military successes were beginning to have a disturbing effect on the population of Russian Poland and accordingly Austria's request for aid must be granted for Russia's own safety. In early 1848 Nicholas had spoken to an Austrian diplomat of his concern about the threat from Galica to Russian Poland and he was to use the same phrase "une insurrection à mes portes" t o the French Ambassador who arrived in Warsaw as the campaign in Hungary was drawing to a close. In a conversation about the reasons for his intervention Nesselrode was to compare the role of the Russian intervention force to that of a fire brigade sent to prevent the spread of a fire which had broken out in a neighbour's house. The Austrians were, of course, well aware of Nicholas' concern about the Poles and it seems quite probable that they deliberately played on his feelings by exaggerating the number of Poles who had enlisted in the Hungarian army. The official commentary which accompanied the Russian manifesto of 8th May 1849 announcing the intervention in Hungary referred to 20,000 Poles serving in the Hungarian army, whereas the true number was much less, possibly 3,000 or 4,000. In short, Nicholas' reasons for intervening in Hungary were a combination of a commitment to the cause of absolutism and monarchical solidarity, combined with a desire to prevent the spread of Polish inspired subversion to Russian Poland and Western Russia. There seems little doubt that it was fear of the Poles which tipped the scales in favour of Austria's request. Indeed, when the news of Görgey's surrender to the Russians on 13th August reached Warsaw Nicholas fell on his knees and thanked God that he no longer had to sacrifice Russian blood for a cause which was not directly the cause of Russia. As Bismarck was to remark in his memoirs, Nicholas was an idealist with a chivalrous nature who never lost this characteristic throughout his reign. But Austria's refusal to come to Russia's aid during the Crimean War was to show Nicholas that there is no such thing as gratitude in politics and that he had been right to have doubts about the wisdom of intervention. The Russian intervention in Hungary was one of the most significant events that took place during the revolutionary years of 1848 and 1849. Its success had an unfortunate effect on Nicholas who became even more convinced of his own omnipotence and even less willing to listen to argument. This judgement by one of the Tsar's closest adviers, A. S. Menshikov, the Minister of the Navy, is echoed by Lord Bloomfield, the British Ambassador to Russia, who had his first audience with Nicholas on 17th December 1849 after his return from leave in mid-October. (The delay was caused by the refugee crisis in Turkey.) In a private letter to Palmerston sent two days afterwards, the ambassador wrote that the "trial of 1849" had succeeded beyond the Tsar's expectations and that he now believed he could "dictate the law to a great portion of Europe." Nicholas seemed to be completely unaffected by the political changes which had taken place and appeared to be more convinced than ever of the "superiority of absolute government and the irresistibilty of his vast power". Despite these words, even Lord Bloomfield seemed over-awed by the sheer size of the Russian army and after receiving a report on it from his French colleague, General de La Moricière, wrote to Palmerston of its great efficiency. The Crimean War was to prove to be a greater test for the Russian army than the eight week campaign in Hungary. "Whatever the purity of the motives which direct the actions of a sovereign of even the most elevated character, Your Majesty knows that personal qualities are not sufficient in international transactions by which a state binds itself towards another in solemn engagements." Thus it came about that four years after his intervention in Hungary Nicholas found himself, as Nesselrode had warned him, fighting a war against Great Britain, France, Turkey and Sardinia while his erstwhile allies Austria and Prussia remained neutral. Even more ironically he found himself wondering how he could best exploit any disturbances that might break out in Hungary in the course of the war in order to make Austria carry out his wishes. It was an outcome to his intervention in Hungary which must have seemed utterly remote on the evening of 21st April 1849, as he sat in his study on the first floor of the Grand Palace in the Kremlin, looking out on the river.